The most famous of all early monks is Abba Antony the Great, who is widely regarded as the founder of monasticism. He was raised in a Christian family in a village along the Nile River. Abba Antony’s parents died when he was approximately 18 or 20 years old, leaving him a considerable fortune. One day, he heard a passage from the Gospel of Saint Matthew in the church: “If you would be perfect, go and sell what you have and give it to the poor, and you will have treasure in heaven” (Matt. 19:21.) Immediately, he gave away all of his earthly possessions and fled to the desert. There, he practiced a rigorous life, both spiritually and physically. Indeed, the word “asceticism” is derived from the Greek word ascēsis, which means “exercise regimen.” The word was applied to Abba Antony’s life, which included manual labor, vigils, and incessant prayer. Born in Thebes (present day Luxor) to pagan parents, he was forced into the military and subsequently captured. He was so touched by the charity and love of local Christians who provided assistance to him while in captivity that he embraced the faith and was baptized in 314. He entered the desert under the guidance of Abba Palamon in 317, imitating the hermitic life of Abba Antony. A few years later, he heard a divine voice calling him: “Pachomius, Pachomius, struggle, dwell in this place and build a monastery, for many will come to you to become monks with you, and they will profit their souls.” Abba Pachomius heard the calling and established the first cenobitic (i.e., “community”) monastery at Tabennesi. He is thus credited as the founder of community monasticism, which is prevalent today. The number of these cenobitic (or “Pachomian”) communities grew at a miraculous rate. By his departure, there were nine monasteries for men and two for women. To deal with the administration of these communities, Abba Pachomius created the Koinonia. This word, which is Greek for “fellowship,” simply describes the federation of these monasteries under a single leader and spiritual order. In addition to establishing community monasticism and the Koinonia, Abba Pachomius was the first to establish a cohesive body of rules for monks. One biographer of the desert fathers tells us that an angel appeared to Abba Pachomius as he was in his cave and told him to create these Pachomian Rules from what was written on a bronze tablet. The only complete translation of these Rules comes to us from a Latin translation that was completed by Abba Jerome in the beginning of the fifth century. Born in Shanshour according to late tradition, he was a contemporary of Abba Antony the Great, from whom he learned much about asceticism. There are many stories of him in the biographies of the desert fathers, and especially, the Apophthegmata Patrum. He established the monastic settlement of Scetis. Born into a wealthy family, but orphaned at a young age. He was forced to marry when he was young, but convinced his wife to accept a celibate life with him. They lived thus for eighteen years until she persuaded him to pursue asceticism publicly. He founded the monastic settlements of Nitria and Kellia, which would become world famous in later years. 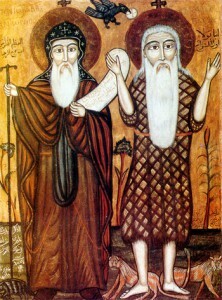 It is important to note that the sayings and stories of the desert fathers, although sometimes treated one cohesive work, are actually several biographies of the desert fathers with unique authors, translations, and dates of authorship. We consider some of them below. This work, Sayings of the Desert Fathers, is a collection of sayings and stories of desert fathers in the fourth and fifth centuries. There are several versions in Coptic, Greek, Syriac, Latin, Armenian, and Ethiopic. This is an anonymous Greek work commonly believed to have been written by several traveling monks from Jerusalem in the late fourth century. Written by Palladius in the early fifth century, this Greek work contains sayings and stories of several desert fathers that Palladius encountered during his journey throughout the Egyptian deserts in the late 380s. The work is named after its recipient, Lausus, the Roman emperor’s chamberlain. This article was written by Fr. Moses Samaan for coptichymns.net.